This is breaking down where the time’s going for a typical deep convolutional neural network doing image recognition using Alex Krizhevsky’s Imagenet architecture. All of the layers that start with fc (for fully-connected) or conv (for convolution) are implemented using GEMM, and almost all the time (95% of the GPU version, and 89% on CPU) is spent on those layers. There are ‘k’ input values, and there are ‘n’ neurons, each one of which has its own set of learned weights for every input value. There are ‘n’ output values, one for each neuron, calculated by doing a dot product of its weights and the input values. Using GEMM for the convolutional layers is a lot less of an obvious choice. A conv layer treats its input as a two dimensional image, with a number of channels for each pixel, much like a classical image with width, height, and depth. Unlike the images I was used to dealing with though, the number of channels can be in the hundreds, rather than just RGB or RGBA! Because the input to the first layer is an RGB image, all of these kernels can be visualized as RGB too, and they show the primitive patterns that the network is looking for. Each one of these 96 kernels is applied in a grid pattern across the input, and the result is a series of 96 two-dimensional arrays, which are treated as an output image with a depth of 96 channels. If you’re used to image processing operations like the Sobel operator, you can probably picture how each one of these is a bit like an edge detector optimized for different important patterns in the image, and so each channel is a map of where those patterns occur across the input. You may have noticed that I’ve been vague about what kind of grid the kernels are applied in. The key controlling factor for this is a parameter called ‘stride’, which defines the spacing between the kernel applications. For example, with a stride of 1, a 256×256 input image would have a kernel applied at every pixel, and the output would be the same width and height as the input. With a stride of 4, that same input image would only have kernels applied every four pixels, so the output would only be 64×64. Typical stride values are less than the size of a kernel, which means that in the diagram visualizing the kernel application, a lot of them would actually overlap at the edges. This seems like quite a specialized operation. It involves a lot of multiplications and summing at the end, like the fully-connected layer, but it’s not clear how or why we should turn this into a matrix multiplication for the GEMM. I’ll talk about the motivation at the end, but here’s how the operation is expressed in terms of a matrix multiplication. Now if you’re an image-processing geek like me, you’ll probably be appalled at the expansion in memory size that happens when we do this conversion if the stride is less than the kernel size. This means that pixels that are included in overlapping kernel sites will be duplicated in the matrix, which seems inefficient. You’ll have to trust me that this wastage is outweighed by the advantages though. Here ‘k’ is the number of values in each patch and kernel, so it’s kernel width * kernel height * depth. 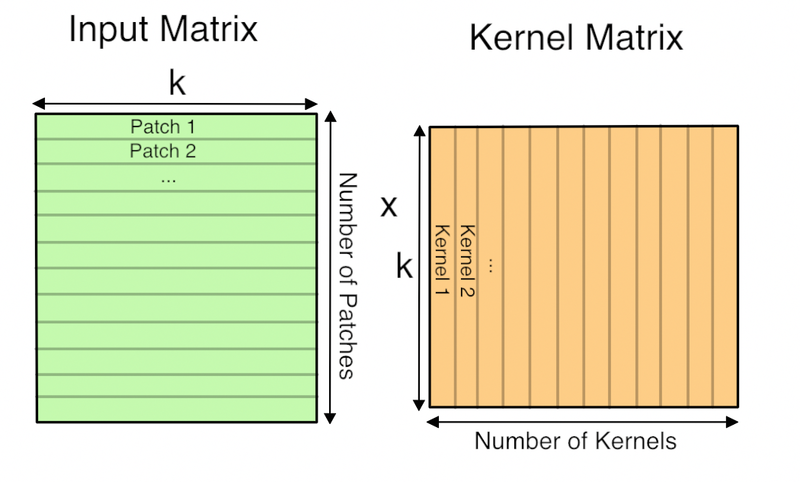 The resulting matrix is ‘Number of patches’ columns high, by ‘Number of kernel’ rows wide. This matrix is actually treated as a 3D array by subsequent operations, by taking the number of kernels dimension as the depth, and then splitting the patches back into rows and columns based on their original position in the input image. Hopefully you can now see how you can express a convolutional layer as a matrix multiplication, but it’s still not obvious why you would do it. The short answer is that it turns out that the Fortran world of scientific programmers has spent decades optimizing code to perform large matrix to matrix multiplications, and the benefits from the very regular patterns of memory access outweigh the wasteful storage costs. This paper from Nvidia is a good introduction to some of the different approaches you can use, but they also describe why they ended up with a modified version of GEMM as their favored approach. There are also a lot of advantages to being able to batch up a lot of input images against the same kernels at once, and this paper on Caffe con troll uses those to very good effect. 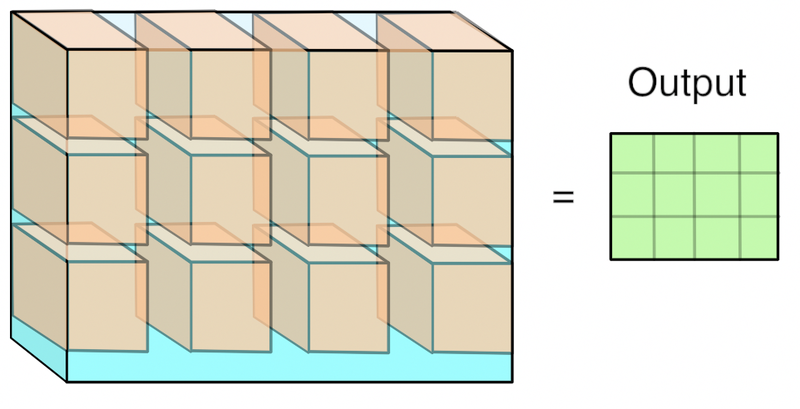 The main competitor to the GEMM approach is using Fourier transforms to do the operation in frequency space, but the use of strides in our convolutions makes it hard to be as efficient. The good news is that having a single, well-understood function taking up most of our time gives a very clear path to optimizing for speed and power usage, both with better software implementations and by tailoring the hardware to run the operation well. Because deep networks have proven to be useful for a massive range of applications across speech, NLP, and computer vision, I’m looking forward to seeing massive improvements over the next few years, much like the widespread demand for 3D games drove a revolution in GPUs by forcing a revolution in vertex and pixel processing operations. What you said is right. You need mxk * kxn to produce mxn. The figure also shows the same. Matrix dimentions are always (no.of.rows x no.of.columns). So, as per the first diagram, the matrix dimensions are mxk and kxn. So, you have what you need to multiply. These are basically full utilization on the Maxwell GPU. So instead of thinking of convolution as a problem of one large gemm operation, it’s actually much more efficient as many small gemms. To compute a large gemm on a GPU you need to break it up into many small tiles anyway. So rather than waste time duplicating your data into a large matrix, you can just start doing small gemms right away directly on the data. Let the L2 cache do the duplication for you. So each small matrix multiply is just one position of the filter over the image. The outer dims of this MM are N and K and CRS is reduced. To load in the image data you you need to slice the image as you are carrying out the reduction of outer products. This is most easily achieved if N is the contiguous dimension of your image data. This way a single pixel offset applies to a whole row of data and can be efficiently fetched all at once. The best way to calculate that offset is to first build a small lookup table of all the spatial offsets. The channel offset can be added after each lookup. This keeps your lookup table small and easy to fit in fast shared memory. So to manage all these small MM operations you utilize all three cuda blockIdx values. I pack the output feature map coordinates (p,q) into the blockIdx.x index. Then I can use integer division to extract the individual p,q values. Magic numbers can be computed on the host for this and passed as parameters. Then in blockIdx y and z I put the normal matrix tiling x and y coordinates. These are small matrices, but they still typically need to be tiled within this small MM operation. I use this particular assignment of blockIdx values to maximize L2 cache usage. The illustration of the matrix multiplication made it really clear1 Also thanks for introducing me to Caffee. 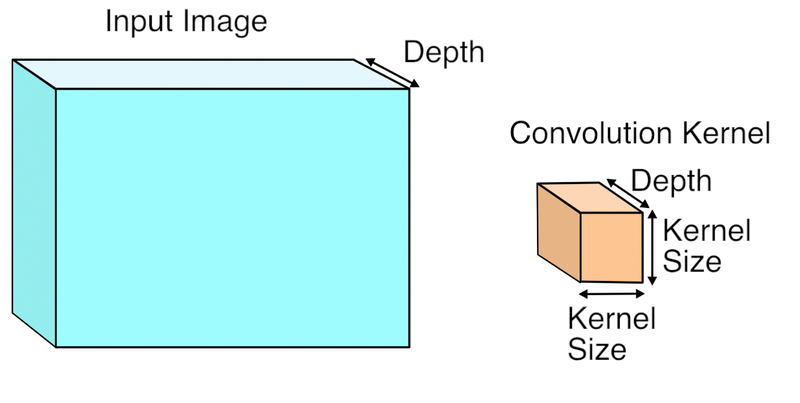 I’m really happy to see this clear introduction about GEMM and deep learning. Especially I’m strongly interested in the engineering side. From the recent updates, CUDA always is bond with the huge Nvidia graphic card with heavy loaded server mother board. I’m now trying to use Raspberry Pi to build a low engergy deep learning cluster. The most recent RPi 2 B is about only several watts each and event 10 RPi is less than 100 watts, which has 40 cores and 40 Giga bytes rams. What’s more, each RPi 2 B has a decent broadcom GPU, I expect I can use it to build a very low energy deep learning cluster. Actually I found your blog about how to use RPi to accelerate the deep learning process. Do you think it’s worth to make Caffe to run in RPi which is heavily relying on CUDA? I’m looking forward to your very insightful opinions. If you think it’s worth to port Caffe to RPi, I’ll start to dig the treasure! Thank you for your great post! Now I understand how GEMM works for convolution. “with a stride of 1, a 256×256 input image would have a kernel applied at every pixel, and the output would be the same width and height as the input” hmm… not quite. This is true iff you use padding of (kernel_size – 1) / 2. Otherwise your output will be input_size – kernel_size + 1, squared. “This means that pixels that are included in overlapping kernel sites will be duplicated in the matrix, which seems inefficient. You’ll have to trust me that this wastage is outweighed by the advantages though.” I am slightly confused by this statement. Are you trying to say that the cost of restructuring the output of one conv layer (by replicating and reorgranizing the data) so that it can be used in the next conv layer, varies quadratically with respect the matrix dimensions, while GEMM has cubic runtime complexity and therefore the cost of restructuring the matrix is insignificant? Or there is some trick that needs to be applied so that restructuring can be avoided?